The gel coat is manufactured by HK Research, It's a NPG-Isophthalic gel coat formulated to provide excellent blister resistance. It is applied 18-22 mils wet. The hull is built with E-QXM 4108, it is designed to optimize fiber orientation for marine hull laminates. This is an unbalanced quadriaxial fabric that has more fiber weight in the highest loaded angle to efficiently stiffen the unsupported panel. In a marine hull application, the 90-degree fiber is typically the most important orientation. More fiber weight is added to this angle to stiffen the shortest panel span. The zero degree fibers are needed for longitudinal stiffness and the +/-45 fibers are added for sheer properties. Mat is needed for inner laminate sheer. The 60" wide cloth extends up and over the tunnel radius. With 3 layers of 4108 in each sponson and 3 layers of 4108 on top of the tunnel, it gives the hull a 6 layer overlap on the tunnel radius. The transom is cored with High Density Coosa, 1.5" thick. It is encapsulated with a layer of 1.5oz mat and 3 layers of 4108. Each layer of 4108 wraps around the corner, onto the side of the boat. The bulkheads are constructed out of 1.5" Coosa High Density foam core, the same core we use for our transom. The foam bulkheads are bedded in bonding putty. The putty is shaped at a 45 degree angle to form a fillet at the edges. The Airex foam core bulkheads are encapsulated with 4108 and tabbed to the hull. A pair of 3" PVC tubes are glassed in for rigging tubes. All of the bulkheads are constructed out of 1.5" High Density Coosa foam core. Limber holes are added to the bottom of each bulkhead and sleeved with 1" PVC to ensure that no water can be trapped in the hull. The cockpit sole is also constructed out of 1.5" Coosa High Density foam core. 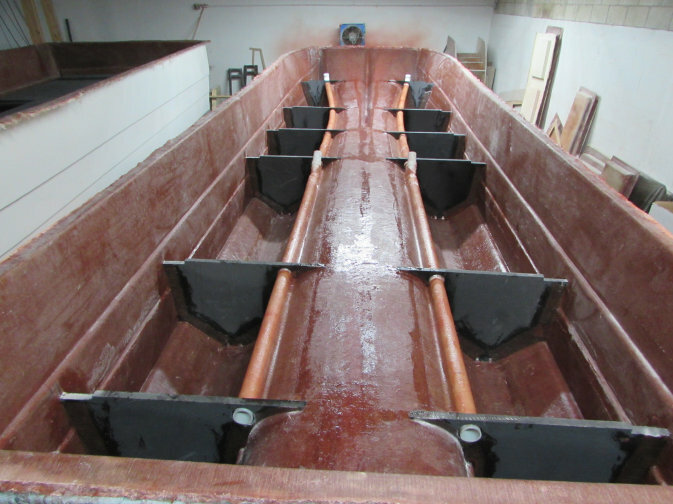 The panels are bonded to the tunnel, bulkheads and perimeter trough with bonding putty and fasteners. The cockpit sole is finished with layers of 1.5 oz. mat cloth and a layer of 4108. 1.5" thick Coosa foam core gunnel supports are glassed to the side walls. The ring deck cap is cored with 1/2" NidaCore under the gunnels and forward deck. 3/4" medium density foam core is used at all of the rod holder and cleat locations. The final layer of 1708 encapsulates the cores. After the cap is fit to the hull, it is glassed to the hull with 1708. Holes are drilled through the gunnel supports for horizontal rod holders and a place to store gaffs, spear guns, boat hooks, mops, etc.